Changes to the way Ficam® D can be used have come into effect. From the 21st January 2019 you will see that the label has changed on new stock. 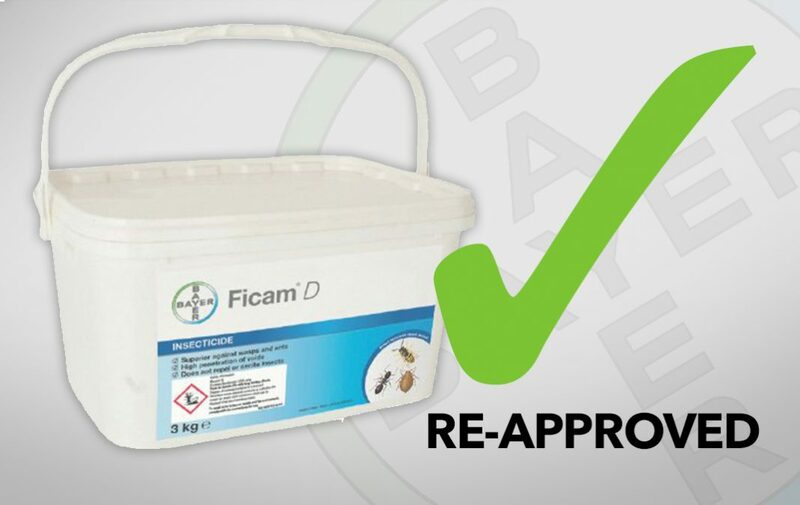 Ficam® D can still be used to treat wasps’ nests. However, the label has been amended to indoor use for control of ants, wasps, hornets (nests) including Asian hornets. Ficam® D can still be used for treatment of internal voids when the Pest Control Operator is applying it from the outside, such as dusting under roof eaves for wasps. Any ‘old’ stock, carrying the pre-21st January 2019 label, will have to be used by the 25th July 2019 and can be applied in line with the ‘old’ directions on its label. i.e. outdoor use is permitted until the final use date. If you have ‘old’ stock of Ficam® D that has a shelf life beyond 25th July 2019 you can re-label it with the new label so it isn’t wasted. Contact your supplier for further details. Some insects have been removed from the label, so do read the label carefully before use. Error: Error validating access token: Session has expired on Sunday, 17-Feb-19 03:23:39 PST. The current time is Thursday, 18-Apr-19 21:38:17 PDT.